Renata Fernandez. ATC Pencil A3.1. 2014. The Series ‘ATC Pencil’ is preceded by my series of large format charcoal drawings, also called ATC. 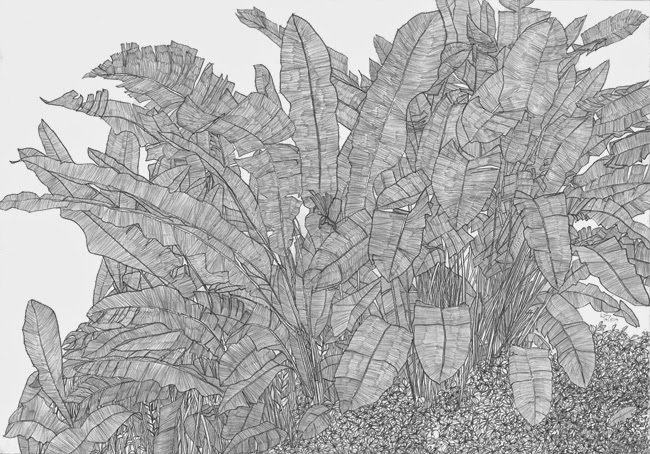 The big charcoal drawings are about tropical vegetation. My paintings on camouflage (2008 - ) gave way to my need for registering flora, as I went from exploring camouflage's painterly qualities (as the landscape that covers the soldier), to paint the landscape where the soldier hides. A trip to my birthplace, Venezuela, allowed to re-connect and rediscover the biodiversity of such place, not needing to go to far from the urban context of Caracas, my city. Renata Fernandez. ATC Pencil A3.2. 2014. A subsequent trip to Venezuela coincided with an invitation to have a solo show in Museo Alejandro Otero, Caracas, Venezuela. 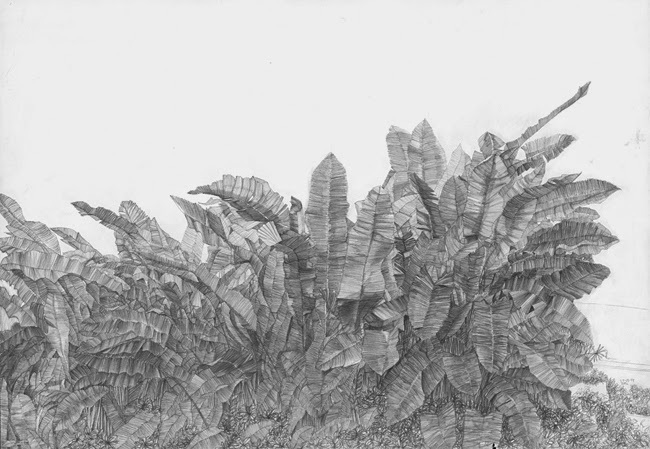 The first 14 large format charcoal drawings (of a total of 25, so far) were the main body of work of TROPICO CAMUFLADO (October 2013 – March 2014). It took me over 2 years to develop it as a series, and they are the result of the appropriation of images of the tropical urban jungle of Caracas, and a reflection on the engineering, life cycle a geometry of the overwhelming nature. Renata Fernandez. ATC Pencil A3.3. 2014. On subsequent trips to Venezuela I continued to add on to my images archive of urban tropical nature, which I called ATC. After exploring charcoal, and relearning to use it, I also then had the need to explore another humble technique: the pencil, using my archive of photographs. I have to mention the artist Michael Landy work as inspiration for exploring the possibilities of lineal drawing. 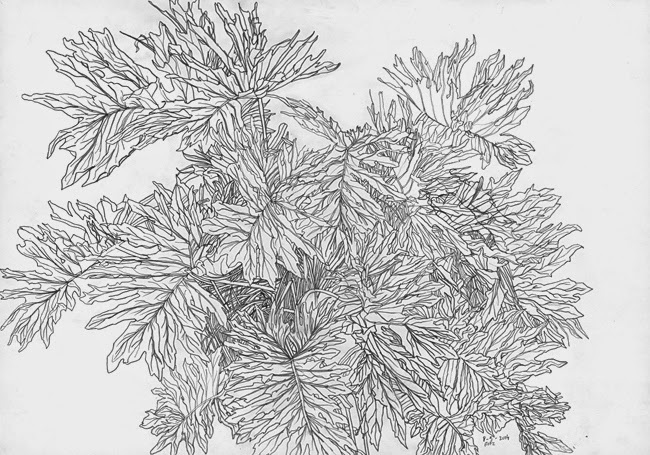 As an admirer of Landy, I was mesmerised by the series of lineal works depicting single weeds. By registering delicately these small and common plants of the urban environment, Landy added a great deal of poetry while observing, and revealing to us, their intricate design. 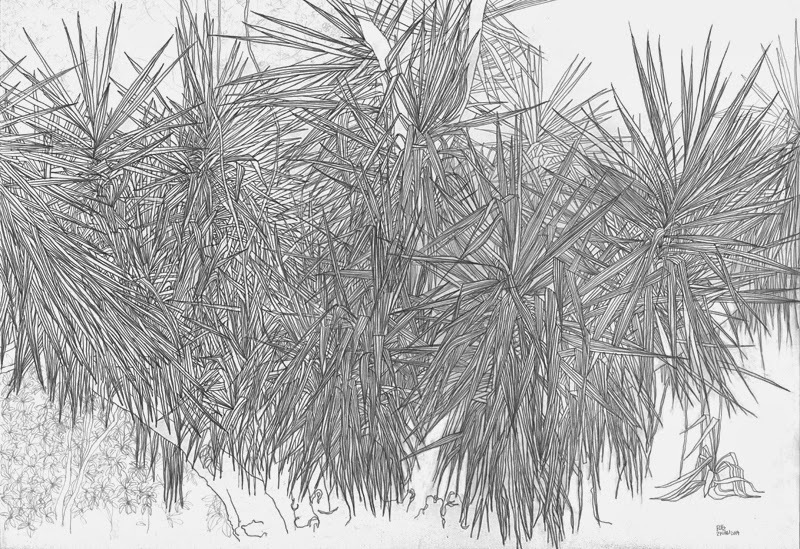 With this new series, pencil on paper, comes the exploration and developing of intricate drawings that allows for a higher level of observation of these structures, the plants from the urban jungle (the complete opposite of Landy's small weeds, but equally common for those living there) a more intimate looking and understanding their growing cycle, geometry and engineering.